Looking for a new truck that stands-out from the crowd? We have good news for you. 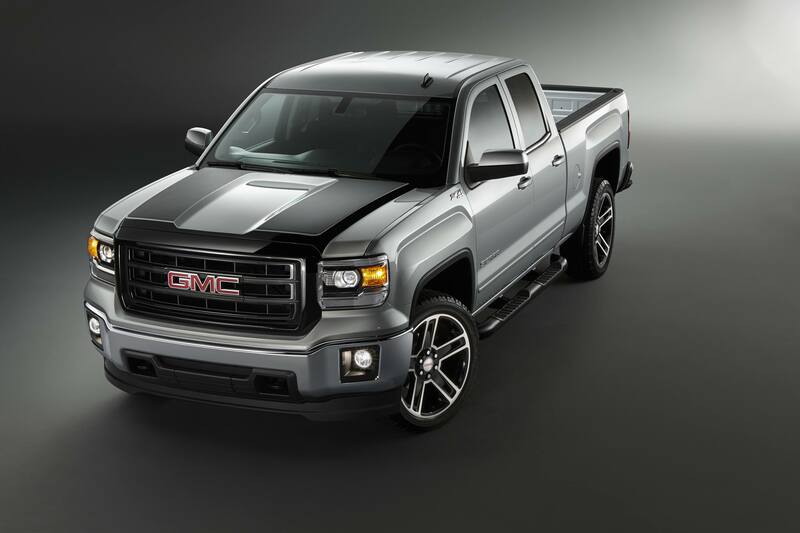 Chevrolet and GMC have just released a trio of new trucks packages that offer plenty of style and substance and are available on a wide variety of Sierra and Silverado models and cabs. From the Silverado ‘Black Out Package’ to the Sierra Carbon Edition, these new trucks offer a wide variety of new looks and options. Those hunting for a more-sinister looking truck should definitely consider the new Silverado ‘Black Out’ package. ‘Black Out’ is available on regular and double-cab Silverado 1500 WT models and includes 20″ black painted aluminum wheels, P275/55R20 all-season blackwall tires, deep-tinted glass and the all-important finishing piece, the black bowtie. Best of all, ‘Black Out’ is affordable and costs just $1,795. For those seeking more blackness, your truck awaits and order books are now open. You can have it in any colour, as long as its black. The all-new Silverado Custom package is the perfect truck for those looking for a more affordable version of the legendary Silverado ‘High Country’ option package. The Silverado Custom is based on the double-cab Silverado LS and features 20″ aluminum wheels, chrome bumpers, chrome mirror caps and door handles, and a body-coloured top-cap above the front bumper. It also includes four full-sized doors, 40/20/40 cloth front-seats, tilt steering wheel, cruise control, power windows, doors and locks and Chevrolet MyLink with 4G LTE WiFi. Buyers can opt for both the 5.3L EcoTec3 V8 (with 355hp) or the 4.3L EcoTec V6. The new Silverado Custom starts at $34, 400 (plus $1,695 freight) and will be available to order later this month. Based on the Sierra 1500, the new Sierra ‘Carbon edition’ is offered in three distinct versions, allowing customers to select exactly which look is right them. The Sierra ‘Carbon Edition 22′ is available on the Sierra SLE crew cab and double-cab models and adds distinctive hood graphics that echo the look of carbon fibre. Two carbon graphics streak down the hood while another carbon touch finishes off the trunk lid. The ’22’ also features a black-painted grill, body-coloured door handles and mirror caps, four-inch tubular side steps, fog lamps, keyless entry, Universal Home Remote, a 110-volt outlet, dual-zone climate control and unique 22″ black alloy wheels. The ‘Carbon 22 Edition’ starts at $42,995. The ‘Carbon Edition 20’ comes available only on Sierra SLE double-cab models and features the same black-painted grill and carbon fibre graphics found on the ‘Carbon 22’. The ‘Carbon 20’ also rides on distinctive 20″ aluminum wheels. ‘Carbon 20’ starts at $38, 595. The standard ‘Carbon Edition’ is based on the Sierra 1500 double-cab and features the same black-painted grill, carbon fibre graphics, and body-coloured trim found on the other ‘Carbon’ variants. It also includes remote keyless entry, a 110-volt power outlet and LED cargo box lighting. Prices start at $32,975. All Carbon editions are available with the choice of two-wheel or all-wheel-drive and the choice of the EcoTec3 V8 or V6 engine. Order books for double-cab and crew cab 2015 Sierra ‘Carbon Edition’ models are now open.